Dr Heather Kidd (RN), Dr Lucia Gillman (RN), Ms Dori Lombardi (RN) and Ms Maha Rajagopal (RN). In 2018, the East Metropolitan Health Service (EMHS) Chief Executive and the Director of Nursing (DoN) of the Royal Perth Bentley Group (RPBG) expressed concerns about the performance of nursing teams and the perceived influence of this on patient outcomes / patient experience. These concerns were raised because of variation in practice across the organisation which gave rise to variability in patient outcomes. The need for effective teams is increasing due to the complexity of healthcare and increasing patient co-morbidities. Team performance is integral to drive improvements, sustain high quality care, and ensure a positive patient experience. Identifying evidence based interventions that help build effective teams and enhance the patient experience is necessary to support innovation and change. 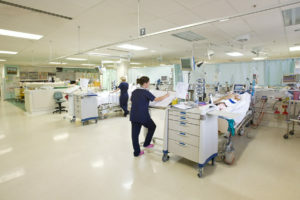 The ANMC initiative consists of five core components: ‘Team Nursing’, ‘Shift Safety Huddle’, ‘Bedside handover’, ‘Intentional Rounding’ and ‘No pass call bell’. These components seek to foster team effectiveness and improve the patient experience. Using a phased roll out approach, this project currently being implemented across the RPBG. By undertaking a large scale evaluation of the effectiveness of ANMC, this study will contribute to the evidence based of strategies that assist to develop effective teams that can support innovation and change to enhance the patient experience.